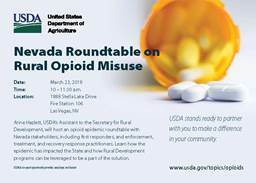 The Pyramid Lake Paiute Tribe and a Fallon treatment center have been chosen as one of the panelist groups for the Roundtable on Opioid Misuse in Rural Nevada, which will be hosted by USDA this Friday, March 23 in Las Vegas. Key topics will include challenges associated with substance use disorder; strategies for prevention, treatment and recovery; and how these measures can be replicated to effectively address the epidemic in other rural communities. President Donald Trump requested USDA’s Anne Hazlett to come to Nevada to hear firsthand the State’s unique perspective on and experience with this issue. Between 2010 and 2016, Nevada has seen a 17 percent reduction in the number of opioid overdoses– from 436 deaths to 387. But during that same time, hospitalizations have increased 30 percent. Although progress has been made, much remains to be done to end the scourge of opioid abuse in rural areas. 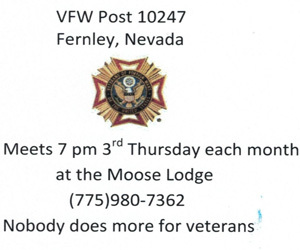 The Nevada Governor’s Office and a panel of Nevada rural first responders, drug abuse treatment providers, and law enforcement representatives will join USDA Assistant to the Secretary Anne Hazlett to address this critical community issue. 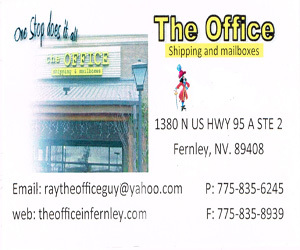 Invited panelists include: Nevada Governor’s Office, Pyramid Lake Paiute Tribe, Elko County’s Vitality Unlimited treatment center, New Frontier Treatment in Fallon, Nye County Sheriff’s Department, Boulder City Hospital and Nevada Department of Health.